Robert F. Smith’s donation will establish a New Precision Oncology Center of Excellence (COE) Serving U.S. Veterans, and Honors the Spirit of Dr. Martin Luther King Jr.’s Legacy. 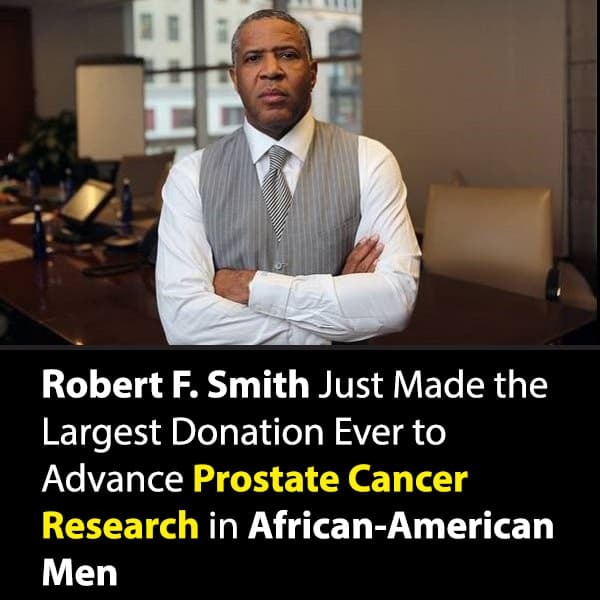 Robert F. Smith made a game-changing $2.5 million donation today to the Prostate Cancer Foundation to fund much needed research to understand why African-American men are 73% more likely to be diagnosed with prostate cancer, and twice as likely to die from it. It is the largest donation ever made dedicated to advancing prostate cancer research in African-American men. Helping to advance revolutionary research in prostate cancer, Robert F. Smith, Founder, Chairman and CEO of Vista Equity Partners, has donated $2.5 million to the Prostate Cancer Foundation (PCF) to focus research on African-American men as well as launch The Robert Frederick Smith Center of Precision Oncology Excellence in Chicago, Illinois – to aid veterans in the metropolitan area and beyond – who are battling prostate cancer. The Smith Center will serve as a precision oncology hub in PCF’s preeminent network of centers working to fulfill the ambitious mission of improving the care of U.S. veterans with prostate cancer. This follows on the support by the Fund II Foundation (led by Robert Smith) for Susan G. Komen and its mission to end disparities in breast cancer survival among African-American women, who are 42% more likely to die from breast cancer than white women. Disparities like these are true health crises that must be addressed. These gifts have the power to save lives, and are a timely way to honor the legacy of Dr. Martin Luther King Jr. Previous articleWTF?! Fetty Wap’s Baby Mama Calls His Other Baby a Monkey! Next articleCoCo Says She Paved the Way for Thick Girls! GREAT. Now we need to get black men to get checked for prostate irregularities. Please start at age 35. 35? Really I thought age 40 was crucial for early testing?? Black men need to be aware of Prostate Cancer. We eat too much red meat and white meat! Wht is it targeted towards us veterans though?! Floyd’s it have something to do with anthrax? Very good to hear this…SALUTE !! !